People often arrange bar-b-ques at their places for friends and family. Nearly everyone likes to have the tender and juicy meat for lunch but among all those people there are very few who know how to cook perfectly. Majority people tend to cook the chops and meat wrong by overcooking them. This is especially true when it comes to pork chops. Not only people make the mistake of taking it out of the fridge and take it straight to the pan, but they also leave it in the pan for so long that the meat gets hard and rubbery instead of staying soft, juicy and tender. Before starting cooking the chops it is necessary that you let them sit out of the fridge for at least half an hour and then put it to cook. The very simple reason for doing this is to allow the pork chops to defrost so that when you cook them, they don’t overcook on the outside if it’s still cold inside. The first step to cook a perfect pork chop would be to let it rest on the counter for a while to defrost. Everyone wants to enjoy juicy and tender pork chops but the problem is that they dry out fast and turn into a large piece of rubber like meat. The best way is to cook them on a medium heat. You can also start with high heat and when the crust turns golden, you can bring the temperature down. If you have maintained a medium heat throughout the cooking, the outer part will go tender while the center will be getting the correct temperature for the perfect pork chop. Once you have cooked the chop, you should leave it for at least 10 minutes before start eating. This allows the juices in the chop to get distributed in the chop entirely and give it a fantastic taste. If you start eating as soon as it is served you will let the juices run on the board and lose the taste of them very easily. There are several ways to cook a single dish. 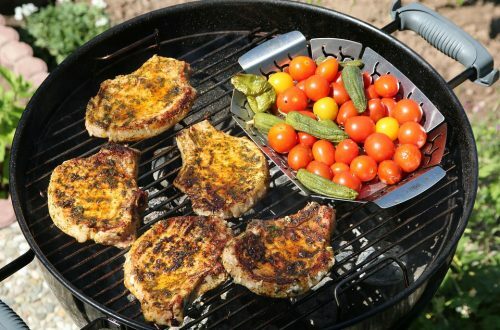 Just like that, there are many ways and different recipes using which you can prepare your pork chops. If you don’t know how to prepare chops manually on the stove, you can prepare Electric Smoker Pork Chops and enjoy the same juicy tender taste. Another great way to prepare pork chops is by skillet cooking them and then transferring them to a preheated oven. The preheated oven will prepare your chops with a finest ending and perfect taste. If you have been cooking for a long time or are just starting it, you can experiment with your meat in several ways and can add a different flavor to them each time. While cooking chops, you need to make sure that the cooking time, heat and temperature are according to thickness of the chop. If the thickness is more than the standard size, it might require 6 to 10 minutes of extra cooking time. It all depends on your taste and your skills that how good you are able to prepare the chops for you and your friends.